The northern province of Ninh Binh is known for its primitive and fanciful landscape. A must-visit place for tourists is Trang An Eco Tourist Site which is located to the east of the province. The site covers an area of 2,000ha and is 95km from downtown Hanoi. It consists of Hoa Lu ancient capital, Tam Coc Bich Dong cave, Bai Dinh pagoda and Trang An tourist site. 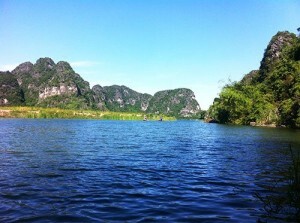 From Hanoi, travelers can book a tour to Trang An at just VND580,000 per person. A tourist bus will pick up guests at 8 a.m. to depart for Bai Dinh Pagoda has is known as the biggest pagoda with the biggest Buddha statue and bell and the most Arhat statues. Bai Dinh was designed in an upside-down U shape with the entrance on the right side and exit on the left. Seasoned artisans meticulously carved the wooden pagoda with skillful patterns that are related to Vietnam’s Buddhism. After taking a look around the pagoda, tourists are served lunch at a local restaurant at 11 a.m. with many delicious specialties made from goat meat in grilled, stirred and boiled cooking styles. Then tourists will depart for Trang An by boat where they will be dazzled by imposing mountains and mysterious caves. For travelers who visit the site on a summer’s day, they are advised to bring umbrellas, hats and overcoats to escape the scorching sun. A boat which can carry four will take a group on a beautiful river to discover numerous dark caves where tourists have to lower their heads to avoid the ceiling at a height of 0.5m or 1m above the boat surface. Trang An has such an amazing system of natural and diversified limestone mountains and caves that people call it ‘Halong Bay on the ground’. During the tour, you will visit Toi (dark) cave which is 315m long and is the longest cave at the tourist site. Next destinations are Sang (bright), Nau Ruou (making wine), Khong, Tran and Quy Hau caves. Tourists are treated to beautiful images of the sky, mountains, river and stalactites of different shapes in one trip.